To the honey of Hymettus." The calling of Kallinikos was not a vain calling. Bent their undefiled heads to the sword and were crowned. Who was cut at the neck by worshipers of sculptures. Duly imperishable were they found in the fire. To the Two Infants Kyriakos and Christian. Were taken up as Christian servants of the Lord. To Marciana, Susanna and Palladia. Were killed by wood for not sacrificing to Pallas. To the Two Hundred and Eight Martyrs. The octet were also beheaded twofold. To the Eleven Thousand Martyrs. David the Prophet declared in psalmody. All of the above Holy Martyrs suffered during the reign of Emperor Antoninus Heliogabalus (218-222), when Maximus was governor [of Galatia]. The way they were martyred was as follows. 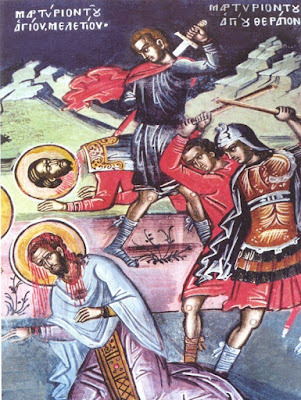 The Holy Martyr Meletios, taking with him Christian soldiers, having also Holy Angels joining them, went to the Greek temple, and by his prayer all the idols and sculptures were destroyed, and they were diminished to dust. When the governor Maximus found out about this, he sent soldiers and had Meletios with his soldiers arrested. When the Saints stood before the governor, they were urged to sacrifice to the idols, and because they could not be persuaded, first they were beaten with clubs for a good amount of time. Then they were struck on their ankles with iron hammers, nailing them to wood. The Saints however had their eyes fixed on the Lord and appeared to not feel the strikes. They then dug into their sides with iron claws and struck their face, on which they made the seal of the sign of the Cross. The blessed ones endured many other torments, each of which produced unbearable pain, and would bring death to the one being tortured. Lastly they hung Meletios from a pine tree, where the blessed one received a martyric end, which for him became the beginning of unending glory and rest in Christ. Saints Stephen and John were beheaded. 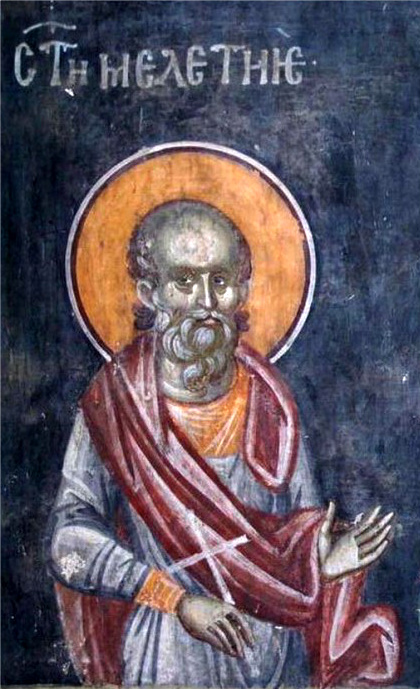 After this Serapion came from Egypt, and having believed in Christ after beholding miracles which took place through the already mentioned Martyrs, and being baptized, he was ordained Bishop by an Angel. The magician Kallinikos also believed in Christ, who after giving deadly poison to Saint Meletios, he did not die. For this reason Serapion and Kallinikos were also beheaded by the governor. Festus, Faustus, Markellos, Theodore, another Meletios, Sergius, Marcellinus, Felix, Photinos, Theodoriscus, Mercurius and Didymus, some of whom were counts, and others tribunes, and others princes, these, when they saw the miracles of Saint Meletios, believed in Christ. For this the governor had them cast into a lit furnace, and by this the renowned ones received the crown of martyrdom. Susanna, Marciana and Palladia were wives of three of the above mentioned Holy Martyrs. Wherefore the savage governor ordered for these holy women and their infants to be cut to pieces with wood. The soldiers who killed them - O the miracle! - immediately after the slaughter died, and justly the wicked died wickedly. Then the two holy infants, who were called Kyriakos and Christian, who were very much undeveloped and young in age, were asked by the governor: "Which God is greater, Zeus or Christ?" The grace-filled and divinely-wise infants responded: "Christ." For this they were immediately beheaded, and the blessed ones received the crown of the contest. The Synaxis and Feast of all these Saints is celebrated in the Temple of the Holy Martyr Platon, which is located in the portico called Domninos.